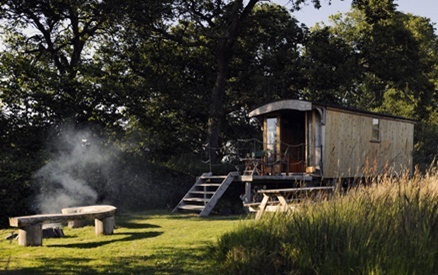 Stock Gaylard Yurt Holidays fits in with our ethos of conservation, preservation and privacy. Our yurts cause no permanent damage to the land and the dark green canvas coverings are in harmony with their surroundings. The location of our yurts is idyllic. They are set within The Stock Gaylard Estate, 1,800 acres of North Dorset's most spectacular countryside, which includes 300 acres of mostly oak woodland. 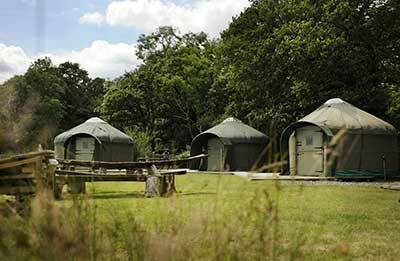 Staying in one of our luxury yurts is the perfect way to enjoy this unspoiled and stunning scenery. The hedgerows and woodlands have been preserved for over 200 years, allowing you to catch sight of the abundance of rare species of animal and plant life that have established. Birdwatchers and botanists alike will find plenty to fuel their passion. This is a perfect place to soak up the sights and sounds of nature right on your doorstep. Unwind and relax as you roam around the estate, taking in its splendour, then fall asleep to the “sound of silence”. 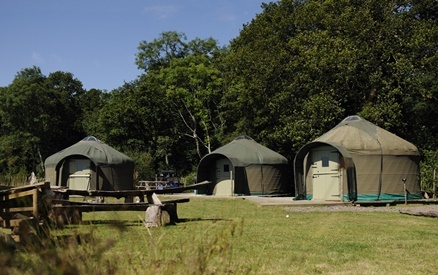 Come and experience the peace, tranquillity and beauty that makes Stock Gaylard Yurt Holidays the ultimate camping adventure. 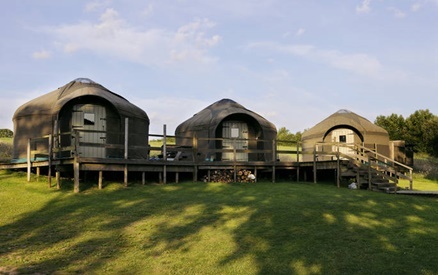 Our yurts are modelled on the traditional Mongolian Ger, which was first created over 2,500 years ago and is still home to almost three-quarters of the population of Mongolia. All the ash wood for the steam bent latticed wall sections, roof poles and crowns of our yurts come from the estate woodland. Each yurt was skilfully handcrafted on site by Jamie Ross, a well-known and gifted local furniture maker, who has also designed and made much of our unique 'yurt furniture'. The covers are made by Cath Pratley, please visit her website. 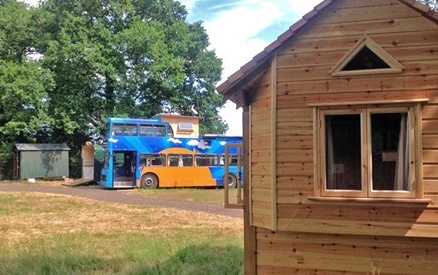 Spacious and welcoming, the yurts stand on wooden platforms, set up in groups of three or four - each with a double bed and two singles plus a futon, and a kitchen/living yurt. They are stylishly and individually furnished allowing you to enjoy the simple pleasures of the outdoors without sacrificing any comforts. All your needs are provided for, including bed linen, duvets, pillows, rugs and kitchen equipment. There are now gas fired hot showers at all sites. Both indoor and outdoor lighting is solar powered, whilst the water for the outdoor bath is heated by a wood fired boiler, which fits in with our aim to offer you a holiday with minimum impact on the environment and maximum comfort, luxury and serenity. Mains Water. Electricity for charging mobile telephones & other devices. All bedding for King size & single beds. Solar lighting & torches. Extra torches & reading lights (only battery or solar, no paraffin or oil lamps please). Small gas camping fridge (standard fridge at Farm). Extra cold box. Starter pack tea & coffee. Food & drink. One load of logs for campfire etc. All cooking pans & utensils, cutlery, crockery, glasses etc. Including bbq tools. Natural History books & guides. Binoculars. Jigsaw puzzles & games. Extra games. Campfire with log seating. Bedding for extra guests. Bath under the stars with hot water tank and gas shower. Bubble bath! Gas hob in living yurt & bbq with start up charcoal Bags of Dorset charcoal available to purchase.